Happy Holidays, everyone! We here at SPIN are taking some well deserved time off until January 2nd. 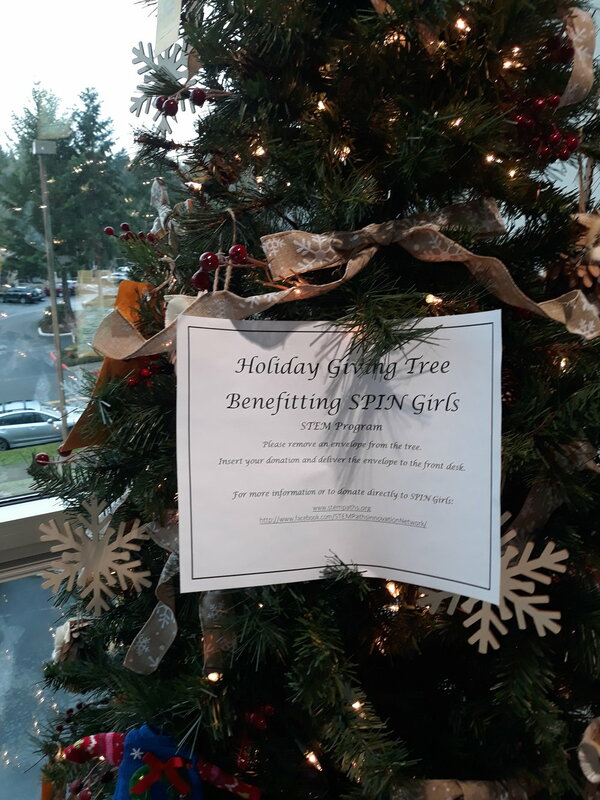 But we did want to share a big shout out and thank you to Echodyne, a STEAM powered company in Kirkland that adopted SPIN Girls for their holiday giving tree. Together, the team at Echodyne raised more than $300 for SPIN Girls - a contribution that will ensure that the girls will be able to use the highest quality materials over the course of their program. THANK YOU Echodyne! SPIN paved many new STEM Paths over the summer - working with families across our region to strengthen minds and strengthen bodies. Before the holidays set in, we wanted to reflect on the work we did over the summer and the families we served. John Muir Elementary School: At John Muir, SPIN partnered with Seattle Public Schools’ Summer Staircase. In the morning, 120 students from across SE Seattle worked on improving their math and reading skills. In the afternoon, SPIN came in and provided 6 fun classes that each student got to cycle through - Robotics, Video Game Design, and 3D Printing on the STEM side, and 3 movement classes that kept bodies moving. We got great feedback from the school about how well run this program was - and it was our very first time offering classes at this scale! Thanks JMES team. Dunlap Summer Math Boost: At Dunlap, we worked with school staff to develop a four week, 6 hour/day summer math boost, including working on math skills, doing experiential math movement activities, and learning through project-based STEM classes. Over 90% of our students improved their math skills over the course of our program. Washington Middle and Mercer Middle Schools: At Washington and Mercer, we taught girl-focused video game design classes, in preparation for the launch of SPIN Girls in the Fall of 2018.